The all-new 2017 Mitsubishi Outlander Plug-In Hybrid Electric has a full-time, twin-electric motor-powered all-wheel control system that provides distribution between the front and rear wheels. A 2.0-liter gasoline engine and two electric motors drive Mitsubishi's Super All-Wheel Control (S-AWC) system. The Outlander PHEV will arrive at Mitsubishi Motors showrooms in Fall 2016. The 2017 Nissan TITAN Crew Cab, powered by Nissan's 390 horsepower 5.6-liter Endurance® V8 gasoline engine, is built on a separate chassis from TITAN XD which was introduced at the Los Angeles Auto Show last November, and is approximately 228.1 inches long (14.7 inches less than XD) and 79.5 inches wide (same as XD), with the cab size shared between the two vehicles. This volume model, half-ton TITAN will go on sale in the late summer of 2016. TITAN will initially launch as a Crew Cab model with Single and King Cab variants planned for later in the model year. The TITAN XD with Cummins® 5.0L V8 Turbo Diesel is on sale now with the 2016 TITAN XD models powered by the new 5.6-liter Endurance V8 gasoline engine starting at $36,485 (including $1,195 destination charge) for the TITAN XD S Crew Cab 4x2 model. The new 2017 Infiniti QX70 Limited, a specially equipped version of the QX70 with different lights and finishes, will be powered by a 325-horsepower 3.7-liter V6 with VVEL (Variable Valve Event & Lift) matched with a 7-speed automatic transmission featuring Adaptive Shift Control. It features an Around View® Monitor system with Moving Objection Detection, Intelligent Cruise Control and Lane Departure Warning and Lane Departure Prevention. Available in rear-wheel or all-wheel drive configurations, it is scheduled to go on sale at Infiniti retailers nationwide beginning in summer 2016. The Hyundai Ioniq Hybrid, Plug-in Hybrid, and Electric models offer three distinct electrified powertrains on a single, dedicated vehicle platform. The Ioniq Hybrid and Ioniq Plug-in Hybrid both feature a new Kappa 1.6 direct-injected Atkinson-cycle four-cylinder engine delivering an estimated 104 horsepower while the electric motor delivers an estimated 32 kW or 43 horsepower, powered by a lithium-ion polymer battery with 1.56 kWh capacity for an estimated total system output of 139 horsepower. The Ioniq Plug-in Hybrid provides an estimated all-electric range of more than 25 miles, powered by an 8.9 kWh lithium-ion polymer battery. The Ioniq Plug-in’s estimated 45 kW or 60 horsepower electric motor is coupled with the 1.6 direct-injected Atkinson four-cylinder Kappa engine. The Ioniq Electric offers pure electric mobility with a 28 kWh lithium-ion polymer battery for an estimated driving range of 110 miles with an estimated maximum output of 88 kW or 120 horsepower giving the Ioniq Electric an estimated 125 MPGe rating. Ioniq offers Apple CarPlay® and Android Auto®, wireless smartphone charging, Automatic Emergency Braking with Pedestrian Detection, Lane Departure Warning, Blind Spot Detection, Rear Cross-Traffic Alert and Smart Cruise Control. The Volkswagen BUDD-e Concept is 181 inches long, 76.3 inches wide and 72.2 inches high and based on the all-new Modular Electric Platform to demonstrate what electric mobility could be like by the year 2019. The 101 kWh battery is flat, to save space, and integrated into almost the entire vehicle floor and powers two electric motors, one to drive each axle distributing power to all four wheels for a top speed of 93 mph and estimated total range of up 233 miles (based on EPA drive cycle) on a full charge. The BUDDE-e offers several levels of plugged-in charging with the added benefit of cordless inductive charging. All of BUDD-e’s systems are operated intuitively by gesture control, touchscreen (displays and touch slider) or voice control. The restyled and refreshed 2017 Acura MDX luxury SUV adds an Electric Parking Brake with Automatic Brake Hold, Auto High Beam headlights, SiriusXM Radio® 2.0, four 2.5-amp USB charging ports, Bi-Directional Keyless Remote Engine Start, two new 20-inch wheel and tire options, power folding side mirrors, and HD Traffic. All 2017 MDX models receive the AcuraWatch as standard equipment, including Collision Mitigation Braking System with automatic emergency braking, Lane Departure Warning, Forward Collision Warning, Lane Keeping Assist, Adaptive Cruise Control with Low-Speed Follow and Road Departure Mitigation. The 2017 MDX Sport Hybrid is the third model to feature Acura's three-motor Sport Hybrid SH-AWD powertrain powered by a 3.0-liter DOHC V-6 engine with Variable Cylinder Management™ mated to a 7-speed dual clutch transmission with an integrated electric motor powering the front wheels, and a Twin Motor Unit with two electric motors providing power to the rear wheels. The 2017 MDX is slated to go on sale at Acura dealerships nationwide this summer and will be joined by the MDX Sport Hybrid later in the year. The new 2017 Toyota Prius Prime plug-in hybrid, 2.4 inches longer, 0.6 inches wider and about an inch lower than its predecessor, will get a manufacturer-estimated 120 or above MPGe (miles per gallon equivalent) and achieve two times the electric range of the previous model at 22 miles, meeting the daily commuter distance of over half of U.S. drivers, and drive at speeds up to 84 mph without leaving EV mode. In hybrid mode, the Prius Prime is targeting a hybrid MPG equal to or better than the Prius liftback. Charging takes approximately 5.5 hours using a standard household outlet and less than half the time with a 240V source. The 2017 Prius Prime will begin arriving in Toyota showrooms in late Fall. The Mazda MX-5 RF (“retractable fastback”) with a power roof that opens and closes with the press of a button while moving at speeds of up to 6 mph and stows away compactly offering the same trunk space as the soft-top model. The Mazda MX-5 RF will have the 155 horsepower SKYACTIV-G 2.0 mated to a a six-speed automatic transmission in the North American model. 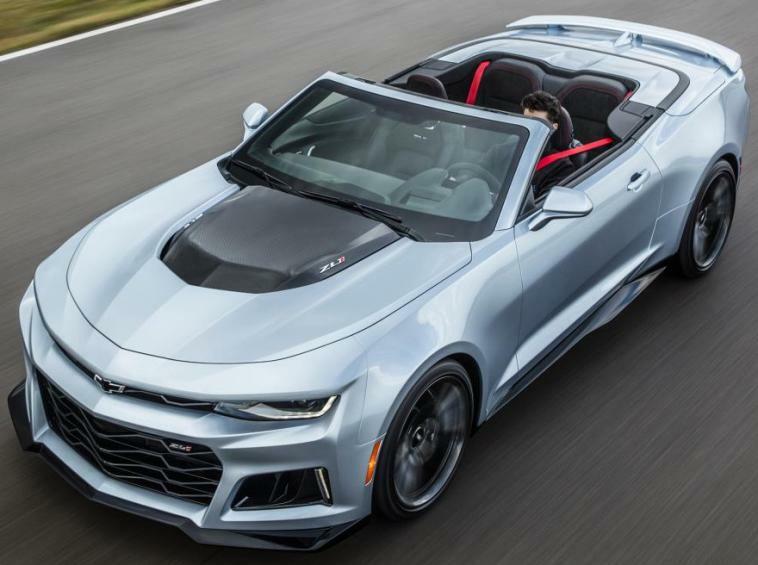 The 2017 Chevrolet Camaro ZL1 Convertible, like the 2+2 coupe, has a 640 horsepower supercharged LT4 6.2L V-8 Small Block engine, with intake and exhaust systems tailored for Camaro, mated to either a standard six-speed manual transmission with active rev matching or all-new, available paddle-shift 10-speed automatic. The lightweight, stiffer structure all-new sixth-Gen Camaro has Magnetic Ride suspension and an electronic limited-slip differential. The Camaro ZL1 goes on sale late this year and the Camaro ZL1 convertible goes on sale in early 2017. The new 2017 Mercedes-AMG C63 Cabriolet, with a multi-layered fabric soft top roof with glass window, is powered by the 469 horsepower 4.0-liter AMG V8 biturbo engine accelerating to 60 in 4.1 seconds to a top speed of 155 mph while the S puts out 503 horsepower and accelerates from 0 to 60 mph in 4.0 seconds to a top speed of 174 mph. Both have the AMG SPEEDSHIFT MCT 7-speed sport transmission with "Sport" and "Sport +"modes and the C63 S also comes with the "RACE" mode. The AMG C63 Cabriolet will be on sale at US dealerships by Fall of 2016. The new 2017 Nissan GT-R has a 565 horsepower 3.8-liter V6 24-valve twin-turbocharged engine with each unit handcrafted by its own Takumi technician. The exterior receives a thorough makeover, the cabin is redesigned and the entire dashboard is new, including an instrument panel wrapped in a single, seamless piece of hand-selected Nappa leather. The 2017 Nissan GT-R will be available this summer. The all-new 2017 Kia Cadenza gets a revised version of Kia’s 3.3-liter V6 engine sending an estimated 290 horsepower to the front wheels via Kia’s first FWD-based eight-speed automatic transmission.The 2017 Cadenza is composed of more than 50 percent Advanced High Strength Steel, more than twice the amount used in the outgoing model. A driver’s knee airbag brings the total number of airbags in the vehicle to nine.The Cadenza is first Kia to be sold in the U.S. under the DRIVE WISE sub-brand, with features like Advanced Smart Cruise Control with stop-and-go functionality, Forward Collision Warning and Autonomous Emergency Braking, and Lane Departure Warning. The Smart Blind Spot Detection System senses unintentional drifting toward an adjacent vehicle and automatically brakes the opposite side front wheel to help maintain the vehicle’s intended course. The second-generation Cadenza is set to go on-sale in late 2016, and pricing will be announced closer to the vehicle’s launch date. The all-new 2017 Subaru Impreza 5-Door, powered by a revised version of the FB 2.0-liter 4-cylinder Boxer engine with Symmetrical All-Wheel Drive, gains direct fuel injection and is now 152 horsepower vs. 148 before and rides on a 105.1-in. wheelbase, up 1.0-in. over the last generation Impreza. Both the Sedan and 5-Door are 1.6-in. longer than the outgoing models, and both are 1.5 in. wider. The 2017 Impreza adds new driver-assist technologies, including Reverse Automatic Braking and the display of steering lines for the standard rear vision camera and a new 4-way Tire Pressure Monitoring System can detect pressure drops at individual wheels. The new Impreza will be available in base, Premium, Sport and Limited trim lines when it arrives in Subaru dealerships in late 2016. The all-new Lincoln Navigator Concept has a 3.5-liter twin-turbo V6 engine delivering more than 400 horsepower and features Pre-Collision Assist with Pedestrian Detection, a 360-degree camera, enhanced park assist and a lane-keeping system that vibrates the steering wheel to alert drivers they are straying from their lane. The all-wheel-drive 2017 Volkswagen Golf Alltrack, based on the Golf SportWagen, has a 170 horsepower 1.8-liter, four-cylinder TSI® gasoline engine mated to a six-speed dual-clutch DSG® automatic transmission with a six-speed manual transmission will be available at a later date. A Drive Mode selector includes “Off-Road Mode,” which adds hill descent control and optimizes traction control for off-road terrain. Six airbags are standard along with Electronic Stability Control, the Automatic Post-Collision Braking System and an Intelligent Crash Response System. Adaptive Cruise Control, Forward Collision Warning and Autonomous Emergency Braking (Front Assist), Lane Assist, and front and rear Park Distance Control with Park Assist are available options. The Volkswagen Golf Alltrack goes on sale in the Fall as a 2017 model. 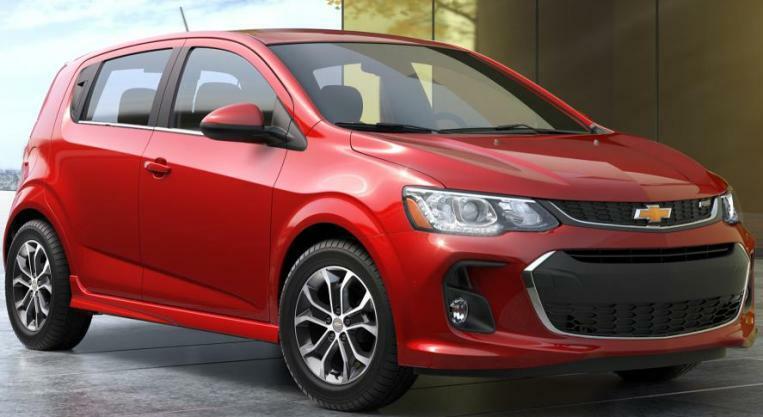 The 2017 Chevrolet Sonic, offered in LS, LT and Premier trims and an RS package on sedan models and LT, Premier and RS for the hatchback, comes standard with an Ecotec 1.8L engine and an available 138 horsepower Ecotec 1.4L turbo engine, mated to a six-speed automatic or manual transmission. Sonic also offers 10 standard air bags, with Forward Collision Alert and Lane Departure Warning available active safety features along with Stabilitrak electronic stability control and an antilock braking system. Rear Park Assist is new for 2017 and a rearview camera is now standard on all models. The 2017 Sonic goes on sale this Fall. The 2017 Toyota 86 is the new name for the former Scion FR-S, which, on the manual version of the car, gets a gear ratio change, a torque increase to 156 lb.-ft, and a five-horsepower increase to 205 horsepower along with Hill Start Assist Control that helps prevent the car from rolling back on steep hills. The new Toyota 86 will go on sale at all Toyota dealerships this Fall. With the elimination of the Scion brand, two other former Scion vehicles will be called the Toyota Corolla iM and Toyota Yaris iA. The 2017 Toyota Highlander three-row SUV gets a new 3.5-liter V6 Direct Injection engine paired to a new Direct Shift 8AT automatic transmission while the standard powertrain on Highlander 4x2 LE gas models will remain the 2.7-liter 4- cylinder paired to a 6-speed automatic transmission. The six Highlander gas models will continue to be (LE, LE Plus, XLE, SE, Limited and Limited Platinum) available in both front-wheel and AWD. The Highlander Hybrid adds two new grades, (LE and XLE) to its existing lineup of Limited and Platinum models for a total of four. The 2017 Highlander will come standard with Toyota Safety Sense P, a new multi- feature advanced safety package that includes Pre-Collision System with Forward Collision Warning and automatic emergency brake, Lane Departure Alert, Automatic High Beams, Pedestrian Pre- Collision System and Dynamic Radar Cruise Control. The 2017 Highlander and Highlander Hybrid will begin arriving at Toyota showrooms this Fall. The Toyota C-HR, shown last November at the LA Auto Show as the Scion C-HR concept, will be Toyota's entry in the compact SUV or C-segment crossover market. The all-new 2017 Corvette Grand Sport coupe and convertible are powered by the 460 horsepower LT1 V8 engine mated to a seven-speed manual transmission with active rev match or the available eight-speed paddle-shift automatic with specific performance calibration. 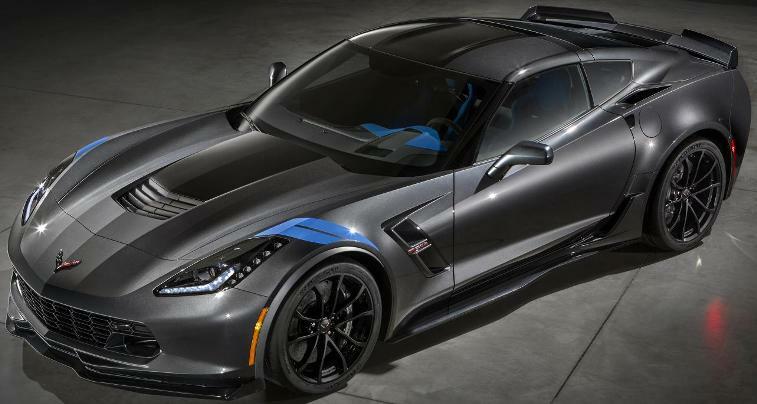 The available Z07 package adds carbon ceramic-matrix brakes and Michelin Pilot Sport Cup tires. The all-new 2017 Corvette Grand Sport coupe and convertible go on sale this summer in the U.S. The 2017 Honda Civic Hatchback Prototype previews the design of the 2017 Civic Hatchback, launching later this year as the third new Civic variant, including the 2016 Sedan and Coupe and still-to-come Civic Si variants and new Civic Type R. Honda discontinued the Accord Crosstour for 2016 so this may satisfy those five-door hatchback enthusiasts. The Aston Martin DB11, powered by a 600 horsepower 5.2-liter twin-turbocharged V12 engine mated to an 8-speed automatic ZF transmission, has electric power steering and torque vectoring by braking and accelerates from 0-62 mph in 3.9 seconds with a top speed of 200 mph. Multiple driver-selectable dynamic modes - GT, Sport and Sport Plus - progressively intensify the response of the engine. There's a full-colour 12” TFT LCD display for the all-new instrument cluster that has an intuitive rotary control, with an optional touchpad offering character recognition, multi-touch and gesture support and an additional centrally-mounted 8” TFT screen dedicated to infotainment. The Aston Martin DB11 starts at $211,995 in US with first deliveries scheduled for the fourth quarter of this year. The Lamborghini Centenario, built entirely of carbon fiber, celebrates the centenary of founder Ferruccio Lamborghini's birth with only 20 coupé and 20 roadster versions to be produced and all 40 cars are already sold, at a starting price of 1.75 million euros or $1.9 million U.S. dollars plus tax. The Centenario has a 770 horsepower V12 engine that provides 0-100 km/h or 0-62 mph in 2.8 seconds and from 0-300 km/h or 186 mph in 23.5 seconds, reaching a top speed of more than 350 km/h or 217 mph. General Motors (Chevrolet, GMC, Buick, Cadillac) February total deliveries were 227,825, down 1.5 percent while retail sales of 179,958 is a 6.6 percent gain over 2015. Year-to-date sales of 343,013 is up 7.7 percent over last year's first two months of the year. Toyota Motor Sales, U.S.A., reported February 2016 sales of 187,954 vehicles, an increase of 4.1 percent from February 2015 on a volume basis. Toyota division February 2016 sales were 164.864, up 4.7 percent. Lexus reported February 2016 sales of 23,090, up 0.4 percent. Year-to-date sales of 349,237 is 0.4 percent increase over last year. Ford Motor Company’s U.S. sales were 217,192, up 20 percent in February versus a year ago. Retail sales grew 11 percent, the best February since 2005. Lincoln had sales of 8,039 vehicles, a 30 percent increase. Year-to-date Ford sales are 390,915, up 9 percent over the first two months of 2015. FCA (Chrysler, Dodge, Ram, Fiat, Alfa Romeo) reported U.S. sales of 182,879, a 12 percent increase compared with sales in February 2015 for the best February sales in 10 years. Year-to- date sales of 337,916 is a 10 percent increase over last year. American Honda reported record February sales of 118,985 Honda and Acura vehicles, an increase of 12.8 percent. Honda Division set a new February record with 106,212 units sold, up 14.9 percent; Honda car sales reached 57,267 while record February truck sales totaled 48,945 for the month. Nissan Group announced total U.S. sales for February 2016 of 130,911, an increase of 11 percent over the prior year and a February record. Infiniti sales of 10,371 vehicles in the U.S. during February, was a decrease of 11 percent versus the prior year. Year-to-date sales of 236,645 is a 6.3 percent gain over 2015. Hyundai Motor America reported its best February in company history, selling 53,009 vehicles for the month, up one percent versus the same period last year. Year-to-date sales of 98,020, also a one gain over 2015. Kia Motors America announced best-ever February sales of 49,737 vehicles, a 13 percent increase over the same period last year. Year-to-date sales of 88,042 is a 6.9 percent gain over last year. Subaru of America reported record sales for February 2016 totaling 42,011 vehicles, a 1.6 percent gain over February 2015. The company also reported year-to-date sales of 83,112 vehicles, a 1.2 percent gain over the same period in 2015. Volkswagen of America reported sales of 22,321, a drop of 13.2 percent from February 2015. Year-to-date sales of 42,400 is a 13.8 percent fall from a year ago. Separately, Audi reported February 2016 sales of 11,718 vehicles, an increase of 2.3 percent with year-to-date sales of 23,568, up 2.5 percent over 2015. BMW brand February vehicle sales of 22,498 was a decrease of 10.7 percent compared to February 2015. Year-to-date, BMW brand sales of 40,580 is down 8.2 percent from the same period last year. Mercedes-Benz USA reported February sales of 25,632 vehicles, a 0.5 percent drop from last year, with 22,941 Mercedes-Benz brand sales down 2.9 percent, 2,269 for Daimler Vans and 422 for smart. Year-to-date sales of 52,594 is a 0.4 percent increase over 2015. Mazda North American Operations reported February U.S. sales of 21,544 vehicles, representing a decrease of 16 percent versus last year. Year-to-date sales through February are down 10.2 percent versus last year, with 41,247 vehicles sold. Mitsubishi Motors North America reported February 2016 sales of 7,870, an increase of 4.5 percent over February of 2015. For the calendar year, Mitsubishi sales are 14,134. Jaguar Land Rover North America February U.S. sales for both brands hit 7,929, a 25 percent increase from February 2015. Land Rover sales were 6,417, a 31 percent increase while Jaguar sales were 1,512 for a 7 percent increase. For the full year 2015, Jaguar Land Rover U.S. sales were 85,048, up 26 percent. Volvo Car USA, reported U.S. sales of 5,260 vehicles, a 33.1 percent increase versus February 2015. Year-to-date sales are up 21.8 percent. Porsche Cars North America announced February 2016 sales of 3,561 vehicles, up 11.2 percent over February 2015, a new February sales record for PCNA.